I overcooked 2 eggs while working on Egg and Bacon Salad, so, rather than waste them, I figured I’d make lunch for tomorrow—and introduce a new category to BrokeAss Gourmet while I’m at it: Brown Bag Lunch. If you take lunch to work or school, this category is for you. Egg salad was a big favorite of mine growing up and this chunkier, healthier version is a lovely quick, nutritious and high-protein—not to mention very portable—lunch that is cheaper than a burrito (remember, this recipe feeds 2!) and more interesting than the grocery store salad bar. 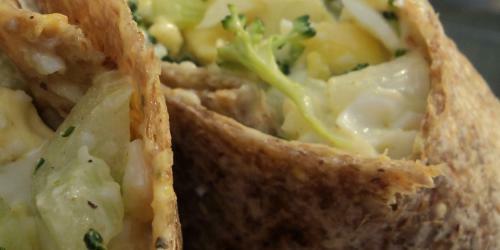 Try the egg salad over greens, in pita, with crackers or simply on its own. This recipe also works well with just egg whites—just double the egg quantity and remove the yolks. Hard-boil the eggs. Peel and rinse under cool running water. Place in a mixing bowl and mash with a fork. Add carrot, celery, onion, mayonnaise, curry powder, salt and pepper to the bowl. Stir well. Adjust seasoning to taste. Divide egg salad between the wraps and roll tightly, like a burrito. Slice in half and serve.